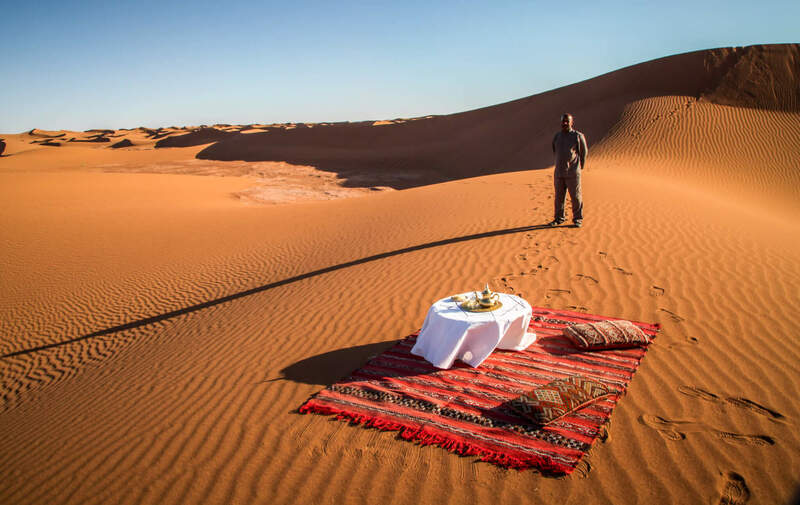 [THE SAHARA, MOROCCO] — I was sitting there polishing off my second Negroni — a Negroni in the frickin’ Sahara Desert — watching the blazing sun rapidly sink over the darkening horizon when here comes Ahmed, barreling over the lip of the nearest dune, in bare feet (!). As if I needed more surprises that day… we start charging off through the sand towards the quickly setting sun. 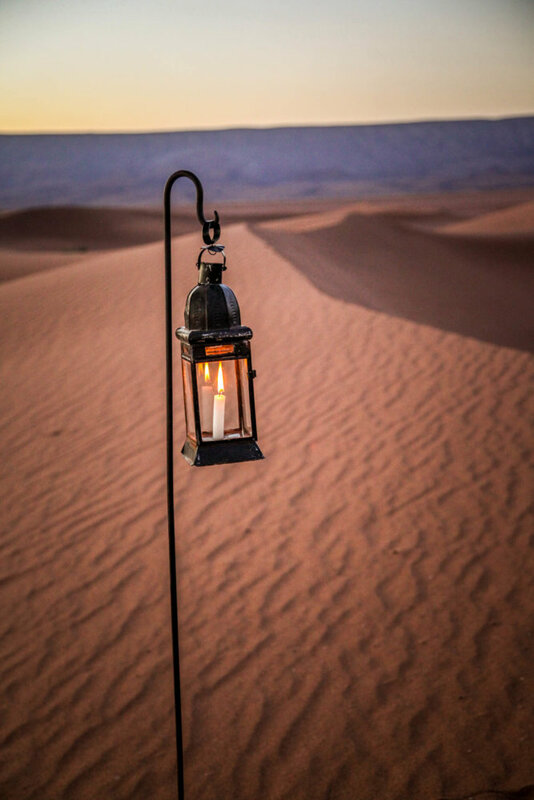 Beautiful glowing lanterns lead the way away from camp, across the the sand dunes. I follow Ahmed as the sun quickly sets. We follow a path along the dune ridges, lanterns illuminating the way, the darkness arriving freaky-fast, almost like a light switch. We top the lip of the ridge and I shriek like a little girl. Ahmed giggles with excitement. We’re peering down over a mini-amphitheater of dunes — I didn’t even know this was here, it was hidden the whole time just on the other side of dunes. There, lining the huge bowl below us was a constellation of dozens… and I mean dozens… of flickering lanterns, all patterned out equally like someone with OCD would want. 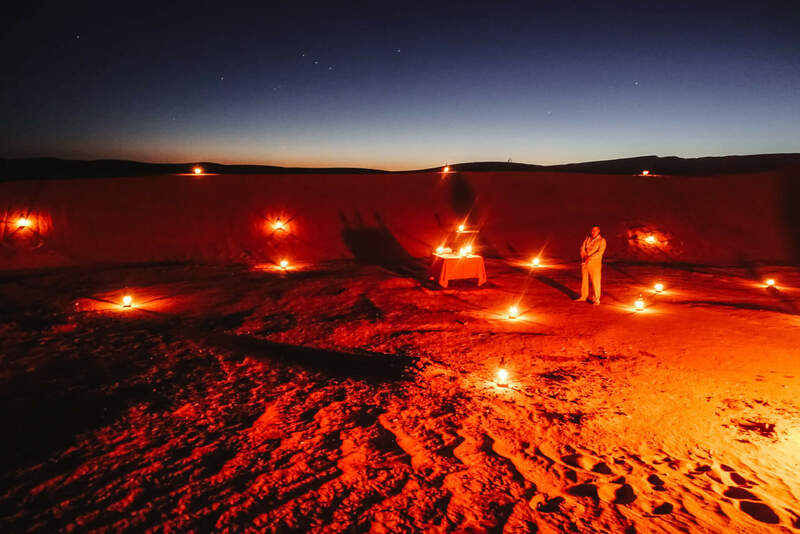 It looked like a concert at Red Rocks in the 70s, lighters in the air… but with bigger flames and sand. Down in the center of the bowl, a roaring fire, torching the sand for many yards. Standing silently, two more of Ahmed’s friendly team stood at attention, grinning ear to ear. And there it was, my Table for One. 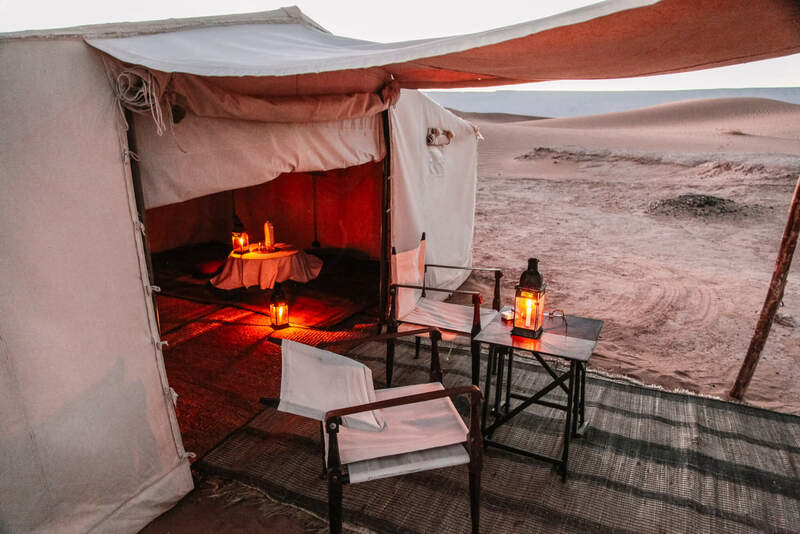 There are dozens of other tent camps out there, some like mini tent villages, some even more elaborate than this, but Dar Ahlam’s philosophy is that the desert experience should just be for one group — whether a family, a couple of couples or even a Party of One like me. The desert is so amazingly quiet, you don’t want some obnoxious group you don’t know bum your mellow. 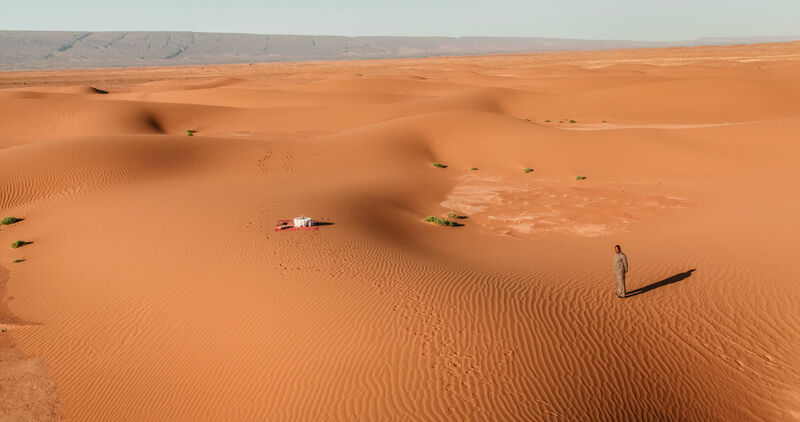 Getting to the tent camp in the desert is half the fun, crawling out of Ouarzazate your brain freezes a little bit. There, in the middle of dusty Morocco is a decrepit old diner, Jetson’s-style, with crooked old Venetian blinds in the windows. Old Buicks and Oldsmobiles sit in the parking lot, their tires flattened with age. 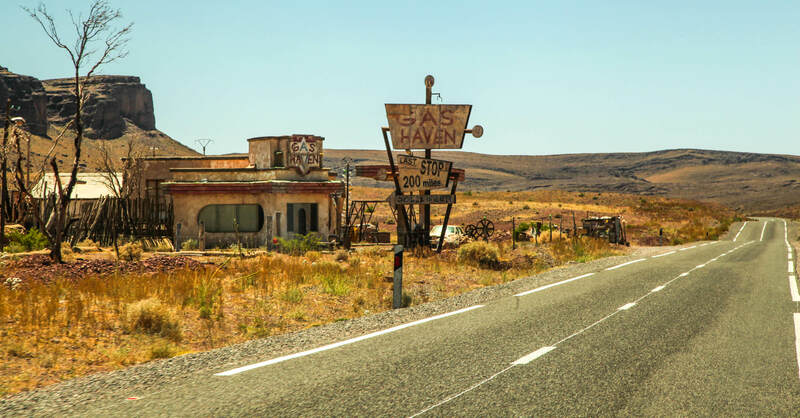 A rusty sign reads GAS HAVEN, LAST STOP 200 MILES. What? So bizarre to see this out here in the middle of Morocco. A fake diner, from signs to name to the dusty Venetian blinds in the windows. Even dusty old Oldsmobiles and American gas pumps. 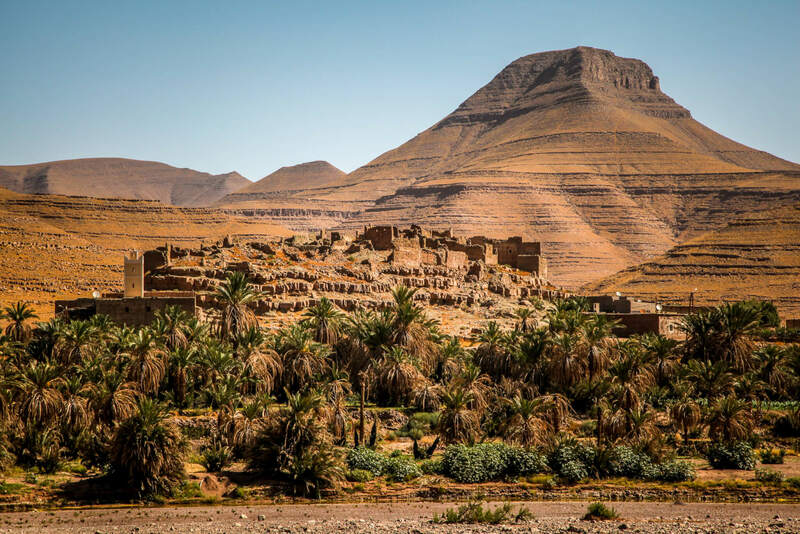 Ouarzazate is the center of Morocco’s famous film industry. 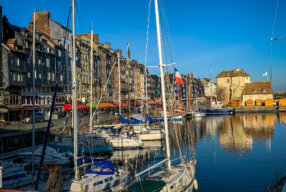 They’ve been making movies here since Cleopatra (the movie), filming such famous movies as Gladiator, Babel, James Bond’s Spectre, Bourne Ultimatum and a surprising amount of Nicolas Cage movies. Also, a bunch of B movies, like this abandoned set for The Hills Have Eyes. Man, all the guides I met breathlessly mention that movie alongside the Oscar winners. I do not believe I’ve seen it, but now I’ve seen its famous set. 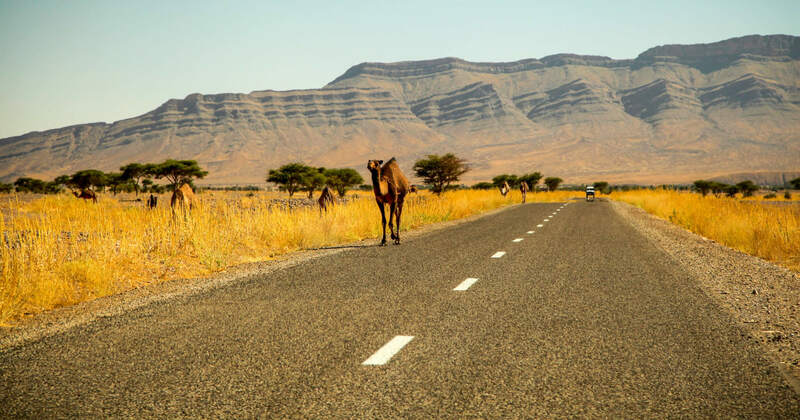 Soon the road starts to flatten out and a vast golden plain opens wide, stratified mountain ridges frame the horizon. 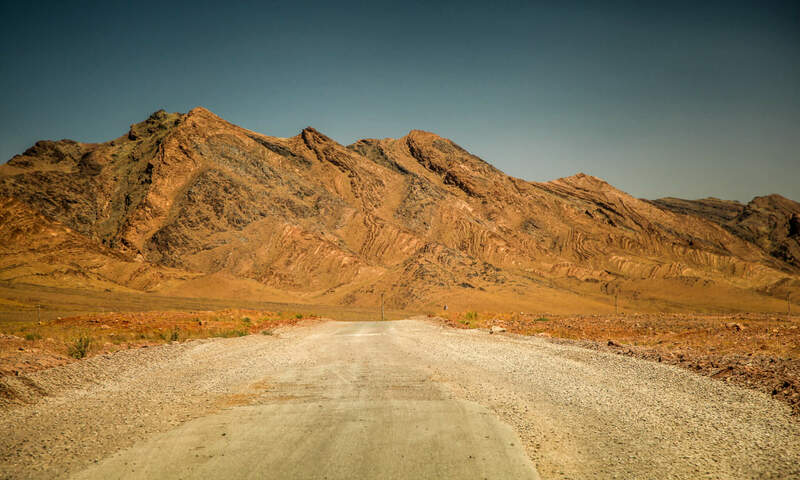 Soon, you’re driving through rugged canyons, with crazy geology that looks like the earth is still forming, glowing with a golden hue of dirt and stone thats makes you wipe your eyes. It’s the colors that get you in Morocco, intensified by the midday sun. So saturated and monochromatic agains the blue sky, you have to wipe your eyes a couple of times. I didn’t enhance this photo at all, like the others ones, I actually had to dial back the color in my shot because it was so intense it didn’t look real. I can’t remember the name of this town on the way to the desert — they all are named using the same set of vowels and consonants; we passed Tamnougalt, Tansikht, Tamezmoute, Taguersift, Tinzouline, Tamegroute, Tagounite… I kinda lost track. But I bought a couple of awesome rugs here. Made by a desert coop of women. Highly recommend, it’s the Real Deal. Now featured prominently in my dining room. And then you move on. Back to Morocco. A couple hours in, Mohamed says “J’ai un surprise!” and pulls off the road, down a bumpy track and straight into a thick palm grove. This is a perfect example of what you’re in for. Lunch in an isolated palm grove, next to a roaring river, local people walking their donkeys down for a drink. 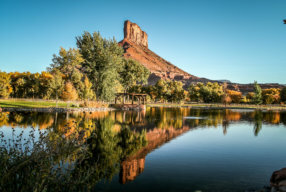 Every now and then, not frequently, you swing around a corner and small monochromatic mud brick towns line the canyons, straddling some rich deep green oasis studded with palm trees. One rammed-earth structure after the other, all a coppery brown — a building model that has worked for centuries. “New buildings, concrete. Need air con.” Mohamed says in his helpful pigeon English. “These? No. Cool in summer. Warm, winter. Better than new.” He nods with confidence. We drive on. And from there, it is sixty kilometers of bronc-riding fun, no dunes in sight until the end. No signs. No directions. Just constantly forking roads splitting off in all directions, Mohamed taking each fork like he just drove through here an hour ago. The first couple of hours is like crossing the moon. The road is rough. No sign of dunes… just stiff, mean rocks like they were spewed from a volcano. 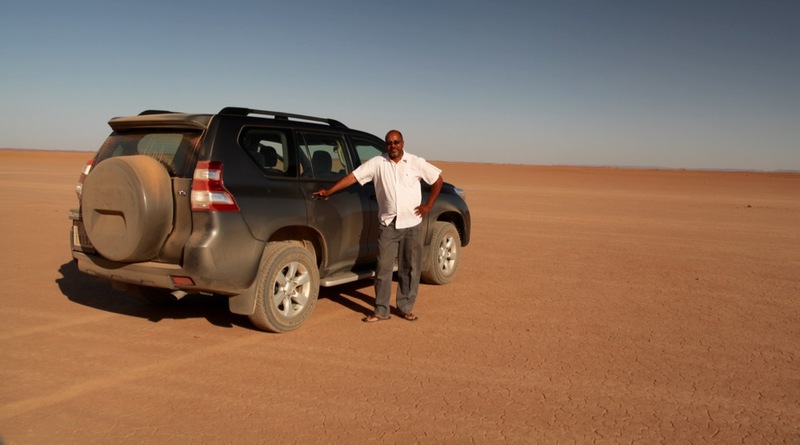 This is Mohamed El Ghachi, he works as a driver and guide for Berber Voyages for Dar Ahlam. As Flo said “He’s the best desert driver in the Sahara.” And I believe him. Once you’re in the desert, there are no signs, just hundreds and hundreds of forks in the road, he must have taken 27 lefts and 16 rights. “How do you know where to go?” “I am Berber. Before roads, before GPS, I know everything, everywhere. Dune. Mountain. I have TPS. Tête Positioning System” he said, pointing at his head. He also helps run this leg of the famous Paris>Dakar Road Rally. The man can top out a Land Cruiser with no road in site. meddesert@gmail.com is his email. Bring your French. And then you spot the dunes in the distance. 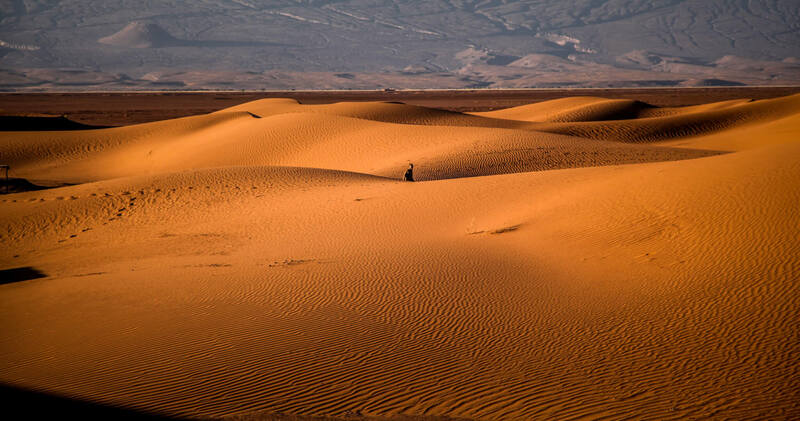 The Sahara. The wind is blowing, but it is completely silent, like in a recording studio. 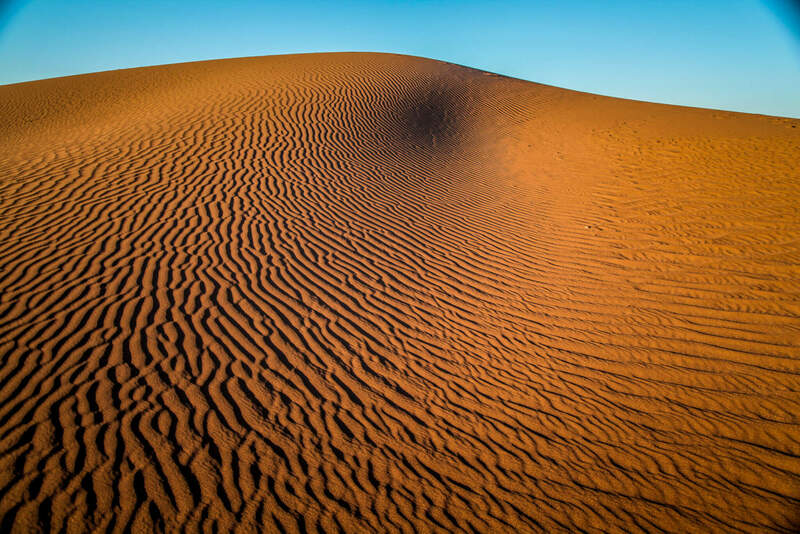 We popped over the tall ridge and, again, all I could see was a vast horizon of rolling copper sand dunes, as far as the eye could see. I spin around and it’s sand 360 degrees and nothing else. Wow, I’m really here. 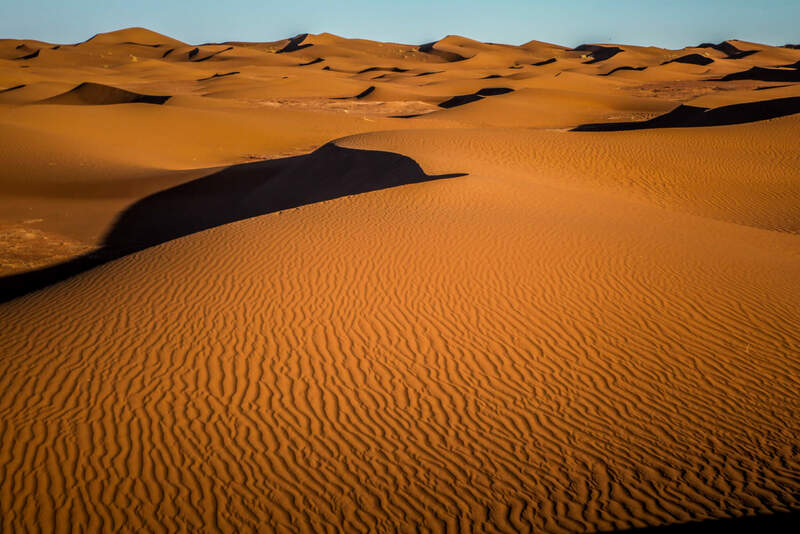 The Sahara. As far as the eye could seen. Dark shadows fighting with the bright dune ridges. The silence was deafening. Like wearing noise-cancelling headphones in an anechoic chamber. The Sound of Nothing. It’s totally disorienting, just hearing your breath and the blood racing through those little veins on the sides of your forehead. That’s when I noticed the sun. Hot. Beating down on me, my clothes sticking to me like flypaper. I scramble up and down the dunes, firing off hundreds of photos, every next angle better than the last. I spun around to drink it all in. And that’s when it dawned on me, there’s someone else here. BAAAAMMMMM! He was waiting for me. Juuuust me. Stagecraft. The brilliant people of Dar Ahlam are masters at it. It’s all about The Setup. And The Surprise. Climbing over a dune or turning a corner and BAM. 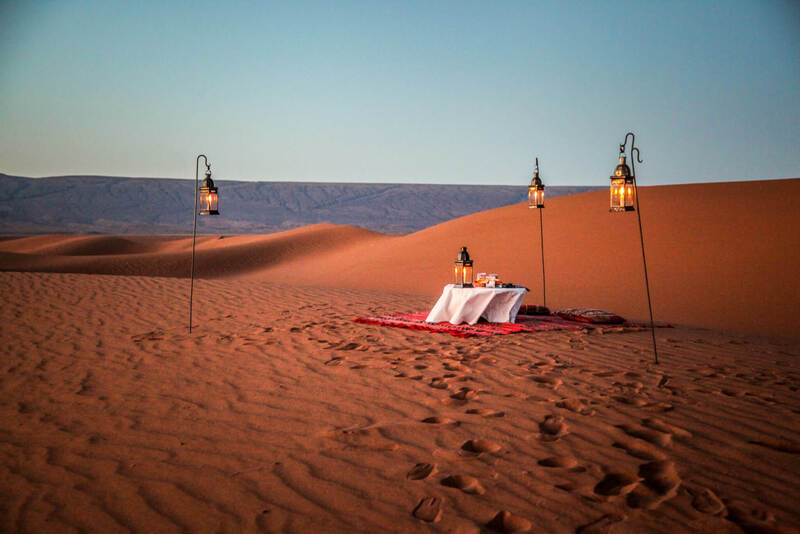 Whether in their hotel or in their desert camp, it’s all about The Surprise. And the amazing team they’ve hired are having as much fun doing it as you are experiencing it. So here I was, just me, a driver, a chef and three other helpers just grinning at the sun and taking it all in. (And they certainly must have lost money on only me, but they still stuck with their philosophy). 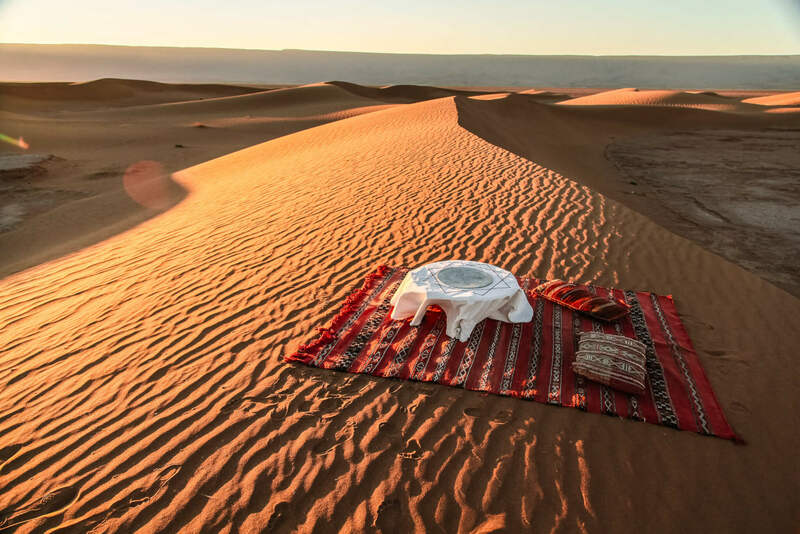 Upon arriving, you climb over a dune and this cool table is waiting for you, a Berber welcome with some mint tea. Does it get any more dramatic than this? I sit down, cross my legs on the beautiful Berber rug, the silence snuffing out my panting breath. 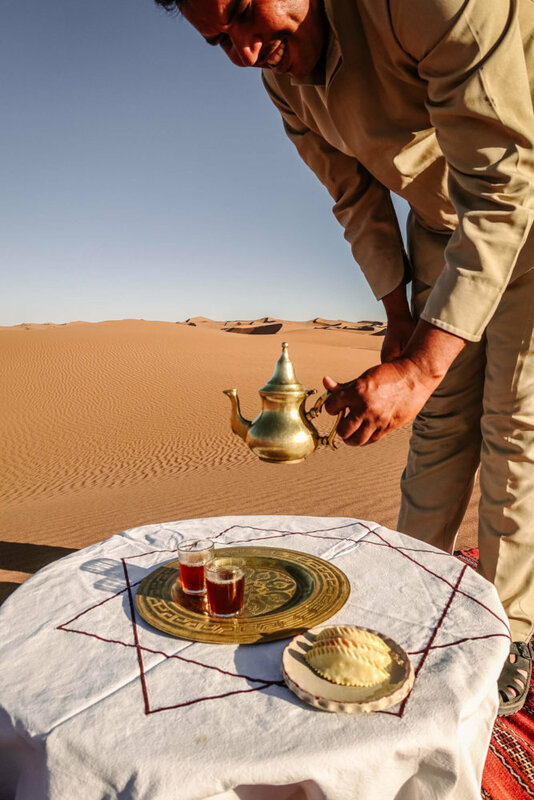 I look out across the dunes and see a smiling gentleman cross the dunes with a tea tray. The ground undulating, but the tray not. Is this really happening? This was like some bizarre movie… but I was in it. “Shooogar?” Please note the smiles on these guys in every picture. I think they were having as much fun as I was, proud to show you how cool this whole setup is. No matter which direction you turned, there was some cool random pattern in the sand. I could stare for hours. You feel like you are scuba diving, except that it’s hot. And dry. 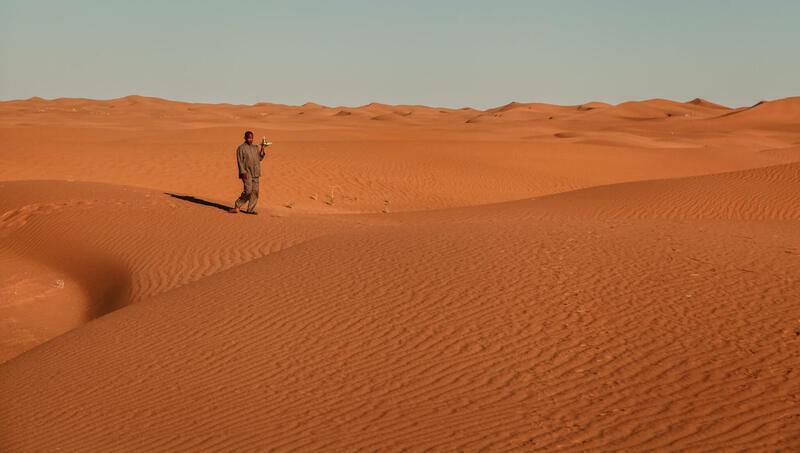 The Sahara is the biggest desert in the world, stretching from the Red Sea to the Atlantic Ocean…. 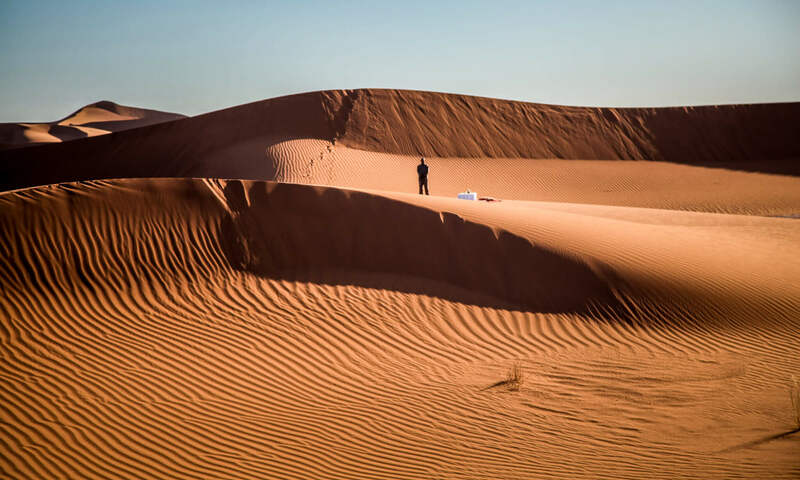 The desert crosses all of North Africa and is as big as China. Every few minutes, the light changes. And so does everything. What you saw just a bit ago, now looks completely different. I can see why people go crazy in the desert. 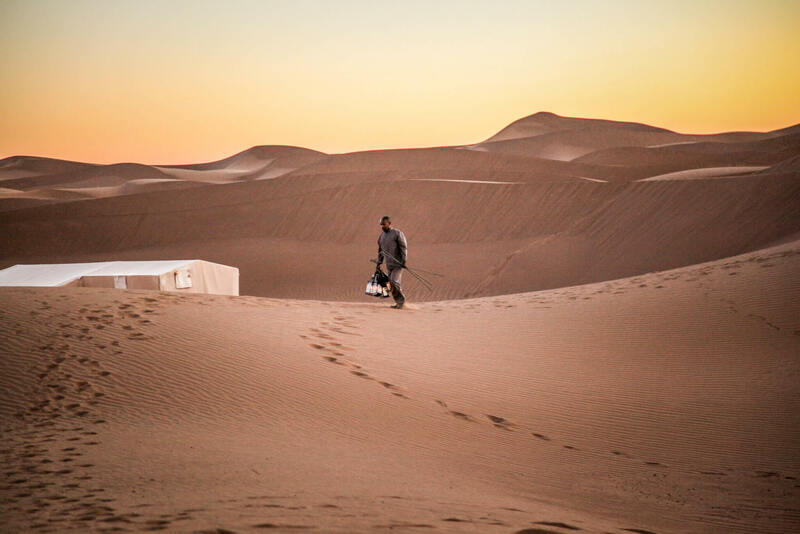 Most tent camps in Morocco are permanent settlements. 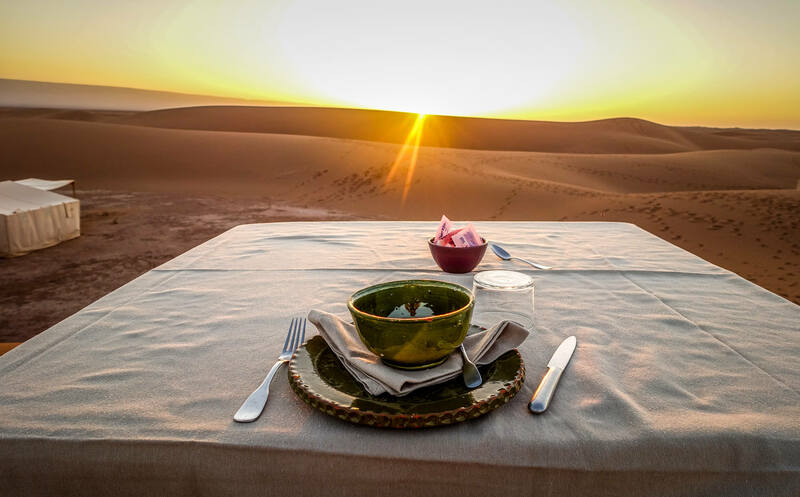 What makes Dar Ahlam’s private camp so special is it is mobile, changing positions with the sands, so you are always afforded pristine views without tracks of footprints. Just yours. There is nothing I have ever experienced like this. 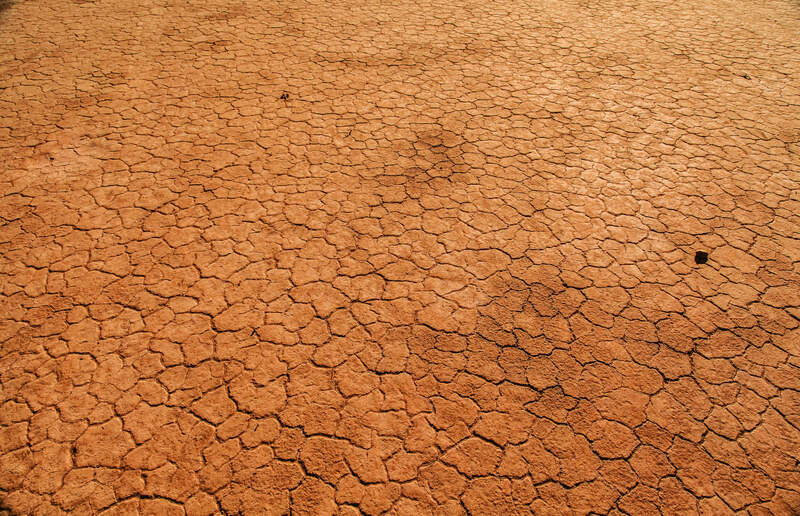 I’ve seen thousands of desert pictures, but nothing prepared me for how eerie it is to be…. immersed. 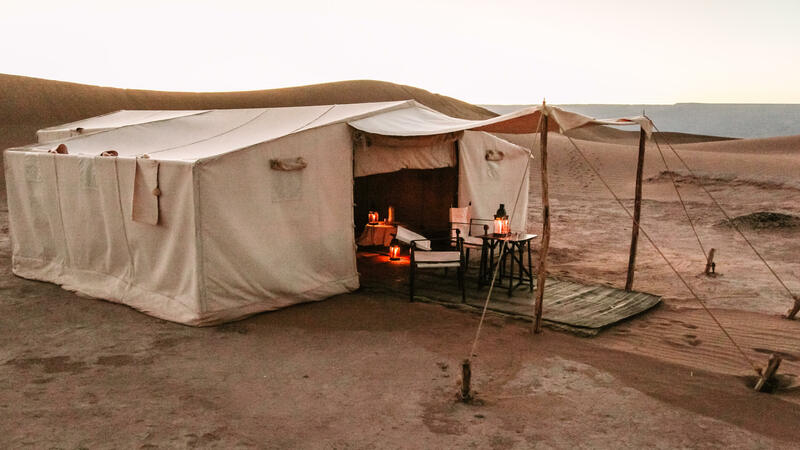 Honestly, I was in such a euphoria, it took me forever to finally notice the tent camp nestled in the sprawling dunes. Can’t believe I was here. 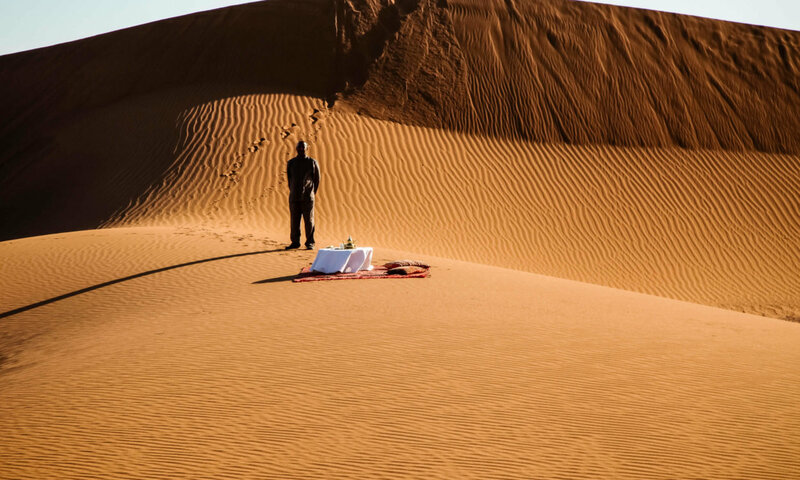 This is no Reception in the desert. You’re already there. The tent setup at Dar Ahlam is perfect, early Out of Africa. With large Belgian tents, campaign chairs and a giant king bed. Each tent has its own bathroom, complete with flushing camp toilet and a shower, the tank warmed by the sun. It’s like an Art Director came in just before you and decorated the whole place, putting every little detail where it should be. Your tent has it’s own gigantic and comfy king bed, as comfortable as a hotel. 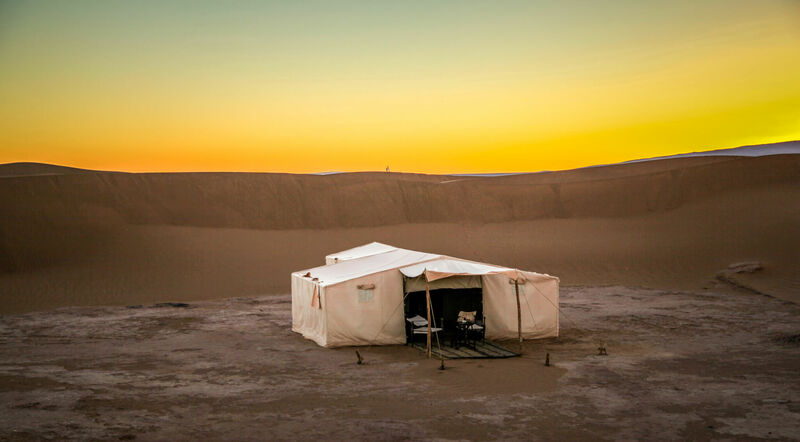 Each tent has its own en suite bathroom, with flushing camp toilet and shower, water heated by the sun. And comfy room to hang out inside. I had absolutely perfect conditions the whole stay, but some nights the wind comes up and you want to stay inside away from the blowing sand. 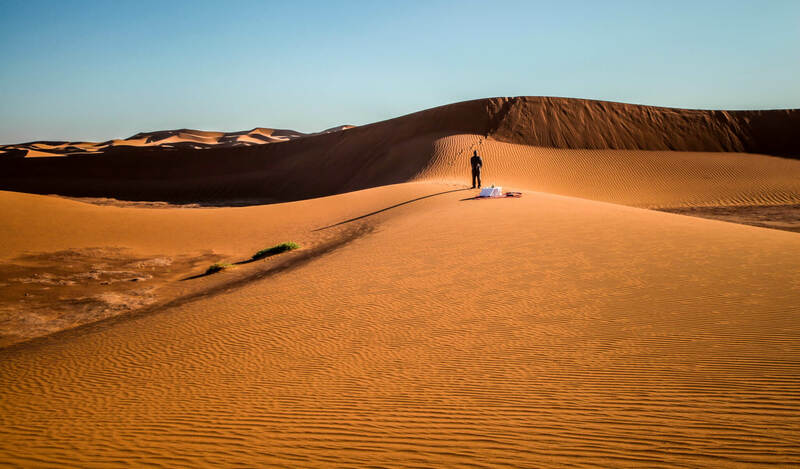 You’re left alone most of the time, every now and then one of the porters can be seen popping over the dunes doing their chores, preparing for your next surprise. After snapping another hundred photos, I sat down with great anticipation. 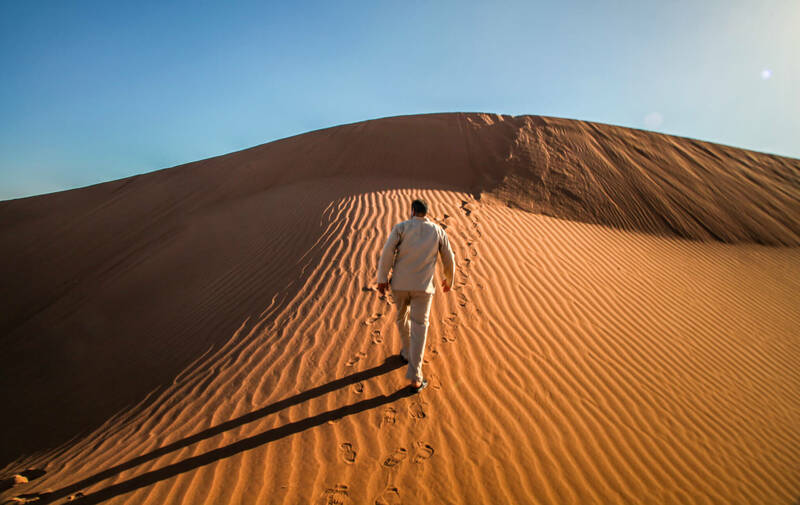 Across a line of shadowed distant dunes, a man’s head bopped in and out of sight… doing and end-around so as not to create unnecessary footprints that would disturb the sunset view. As he approached in the stony silence, I could hear him huffing and puffing, his pants legs breaking the silence as he drew near. 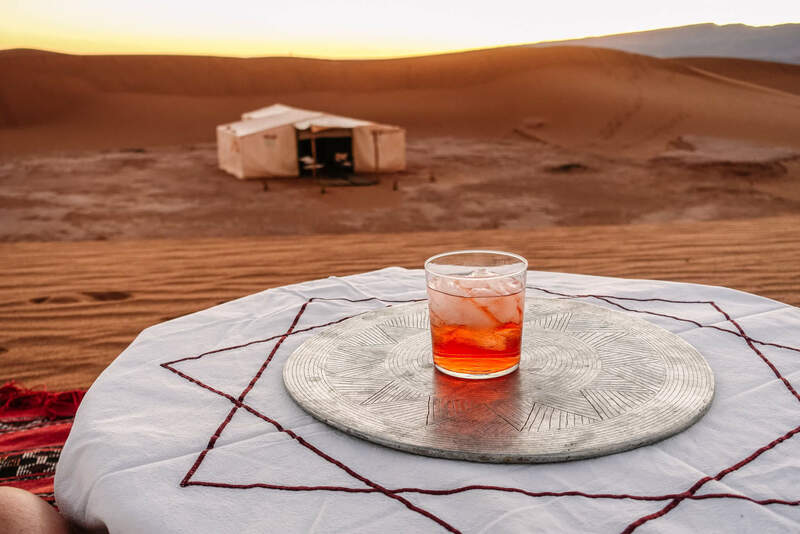 A Negroni in the Sahara. I never really thought about how complicated that’d be when Flo asked me back at the hotel what I’d like to drink at the tent camp. “A Negroni would be great, thanks.” It wasn’t until I sat down to drink in this whole situation that it dawned on me how complicated this actually is. Cut crystal glass. Unmelted ice cubes. Three obscure Italian liquers and a slice of orange peel. Out here, in the MIDDLE OF A DESERT! Five hours from the hotel. I remain humbled and embarrassed, savoring every sip like I was a Catholic altar boy sneaking wine. After the sips went down and the sun slipped over the horizon, the light got spooky wild. All soft and orange. No shadows anymore. Monochromatic. Like trying to spot elk in the mountains in the flat light after sunset. And then things started to get busy… while I just watched.. Soon, the lanterns started coming out. The guys started cling-clanging them across the dunes, carrying iron rods to plant in the sand. And just like that — while I was just sitting there! — the whole table turned into an entirely new stage set. It was like being a cast member in a Cirque de Soleil stage. 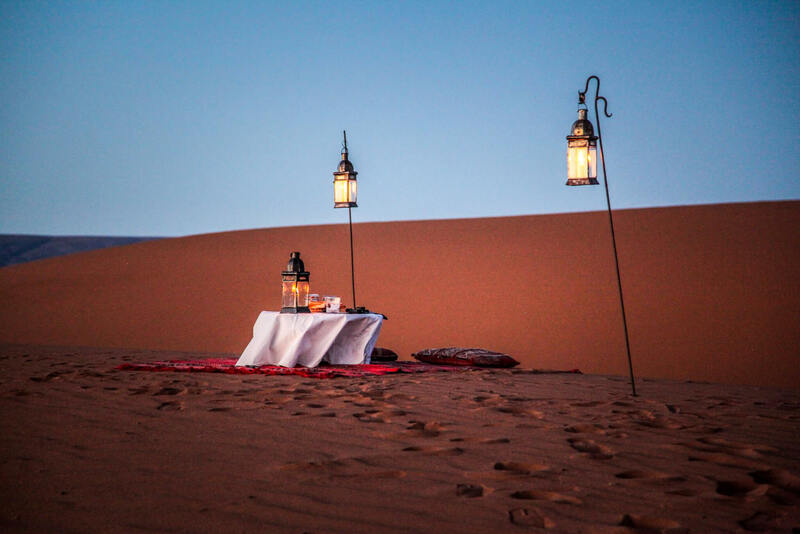 And then, like in all of Morocco, the night changes EVERYTHING. The candles come out. The air is cool. The silence, deafening. And slowly the magic dials up.. I followed behind Ahmed, in awe of all the lanterns mysteriously appearing int the dusk. It was so perfectly timed, it was like they turned off the house lights as I made the trek across the dune ridge, the darkness approaching fast, right before my eyes. Soon, more lanterns. And more lanterns started to appear. And Yet Another Surprise… Dinner. Over a dune we trudged, he with skill, me with Negroni Feet. 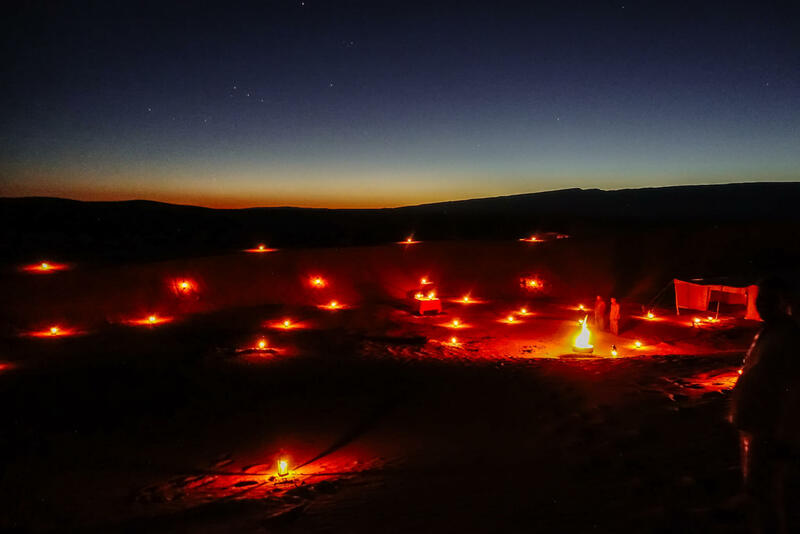 And into a dune amphitheater I did not know was there….a magic bowl of a hundred lanterns, all spaced perfectly around the bowl, flickering in the last light. And in the center, a roaring fire…and my Table for One. There is something quite excessive about this being just for me, without question. I did not plan it that way, it just happened. But even with just one, the crew here took every step to make it the most amazing experience, ever. And as you can see with Ahmed, they grin at the excitement in making this magical. They are Berbers. They’ve go this down. And proud to show you how it’s done. And then you go to bed. They did all this in a simple tent, cooking all day for this meal. Some chatter and clanking emanating from the kitchen tent. And then, a night cap of Cognac under the bright stars. 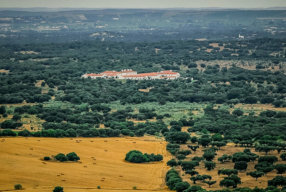 They serve a “tagia” a slow-braised lamb dish that they cook in a ceramic pot in the ground for five hours. One of the best meals I’ve ever had, obvs. After several hours under the stars, I stumbled back to my tent under flashlight, stuffed to the gills, and plumped onto the top of my covers and fell fast asleep. You wake up the early morning before sunrise, in the same flat light of dusk. Sleepy eyed, you wash the sand out of your eyes (literally!) 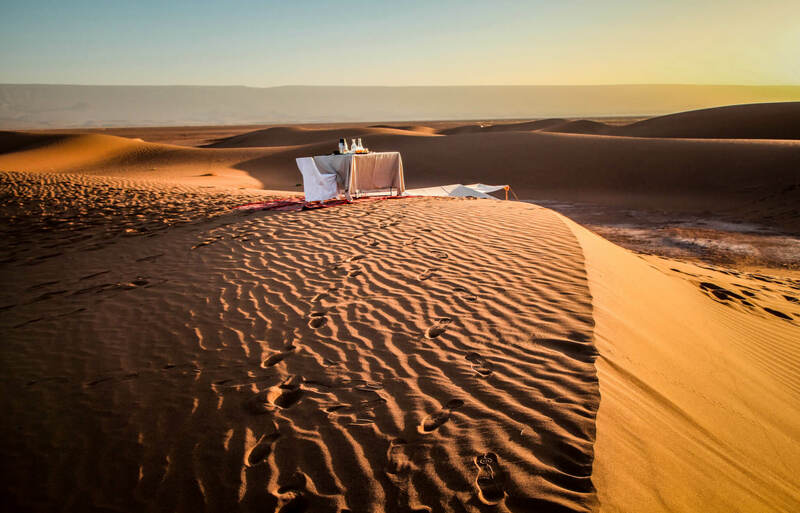 and scramble up to a draped table on a new dune, waiting for the sun. Soon, the flat pink blush light turns yellowy, then a golden orange. Good morning. Fresh squeezed orange juice, fresh baked Moroccan flatbread, apricot jam. Noos-noos coffee with steamed milk. Fresh linens. All out here in the middle of the desert. And just like that, the porters popped out of the middle of nowhere and cleared the whole thing away like it was never there. The same dune I took 328 photos of the night before, now looks completely different. After a quick nap, it was time to go. It starts getting hot fast, and the sand fleas start popping out of nowhere. 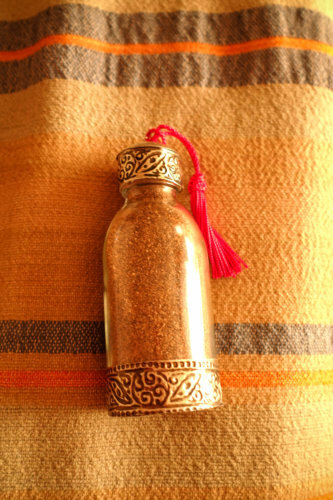 One of the coolest treasures ever — coming back from breakfast, there was an ornate vial on my bed. A souvenir. 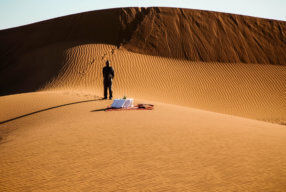 Sand from the Sahara to take back and remember this night. Leaving in the early morning, we took a different way back, stopping by ancient desert forts, some thousands of years old. We rounded a particularly gnarly point in the road and all of a sudden two tiny nomad kids come running up alongside the car, running over the sharp rocks in their bare feet… keeping up with us! Laughing, Mohamed rolls down the window. “My girlfriend.” He said something to her in Arabic and she nodded, Mohamed gives me a giant orange to hand to her. She looked at it like a treasure and ran off. We drove over an anonymous dune and stopped at this old well, used by nomads for hundreds of years. Right here. In the middle of nowhere. And he showed me how it’s done. Mohamed turns around, takes some water and splashes it on the ground. Right there, in this spot, fossils all around us. Did I mention that Mohamed was a top driver in the Paris>Dakar Rally? 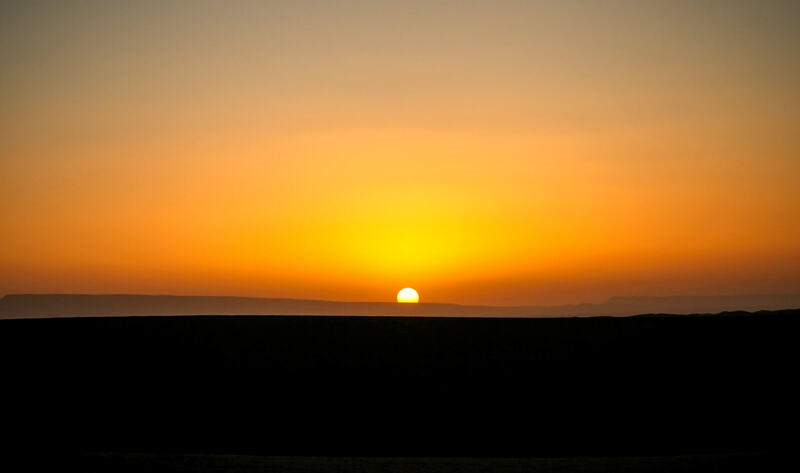 As we pulled out of the dunes and onto the hard flat desert soil, we had liftoff…. Flying over the desert from YouShouldGoHere on Vimeo. 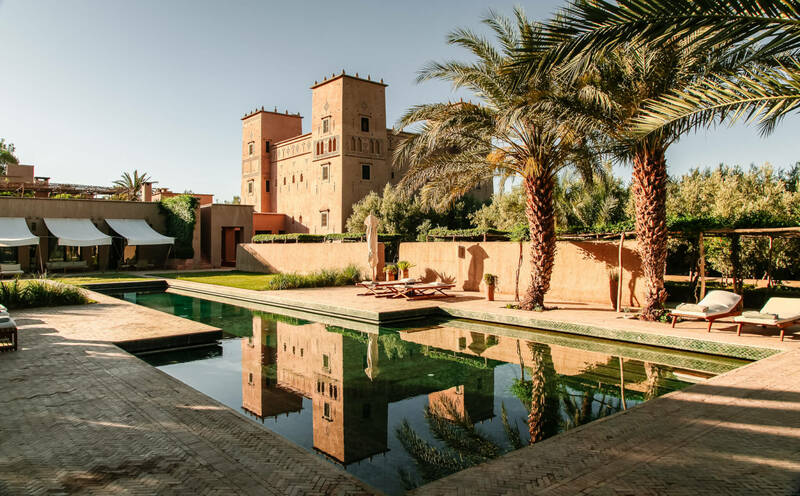 And with that, off we were back to the Dar Ahlam kasbah in Skoura for another several days of relaxing by the pool, eating great food and exploring the vast lands of Morocco. Here is a link to Dar Ahlam’s beautiful website, outlining this and many other extraordinary experiences. And the listing from Scott Dunn Travel, one operator I’d highly recommend for door-to-door arrangements. And a great article in The Financial Times. 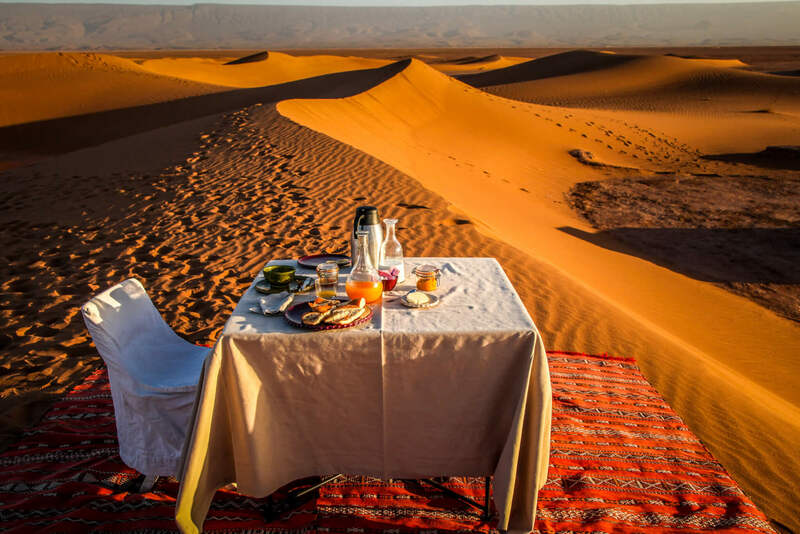 Here is a link to the 700000 Hours travel website — the travel concept company that runs Dar Ahlam and other new amazing adventures around the world. Here’s what Conde Nast Traveler had to say about a similar trip, staying at Dr Ahlam. 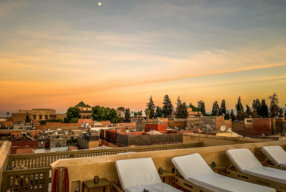 And Travel & Leisure’s article Morocco Beyond Marrakesh Both with much better pictures than mine! And another article in Forbes. And if you want someone to book it, email the best travel agent there is, Ginny Mariano, she put this whole thing together. 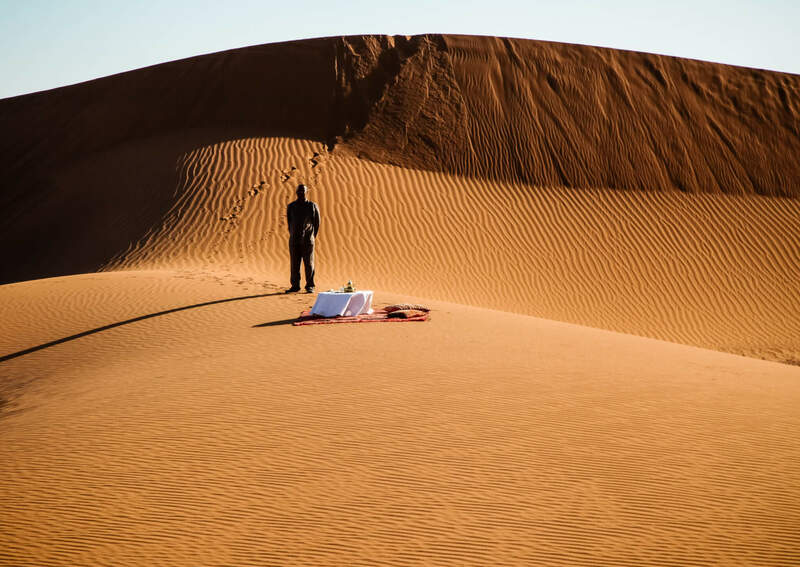 This is the article that sparked the fire for me to come to Morocco. 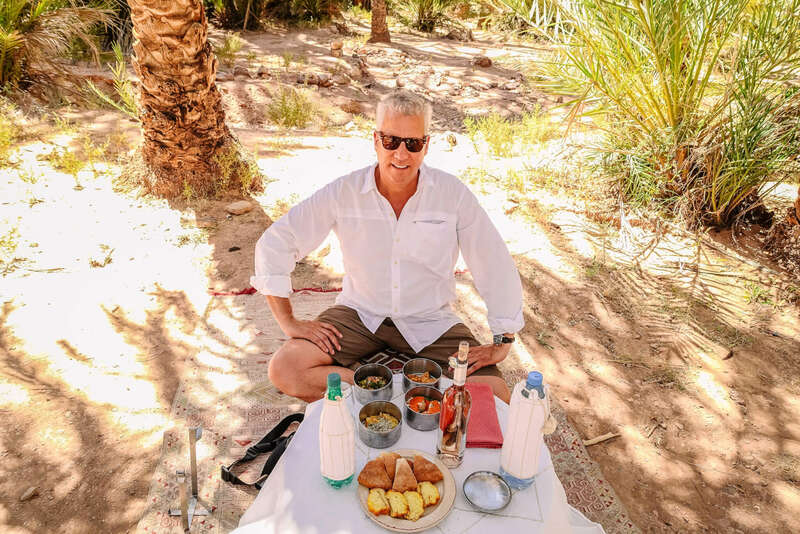 I read this and thought “I gotta go there.” Here’s a fantastic article on the Moroccan desert and mountains experiences from the UK’s excellent Conde Nast Traveller. And another Moroccan article in CNTraveller. 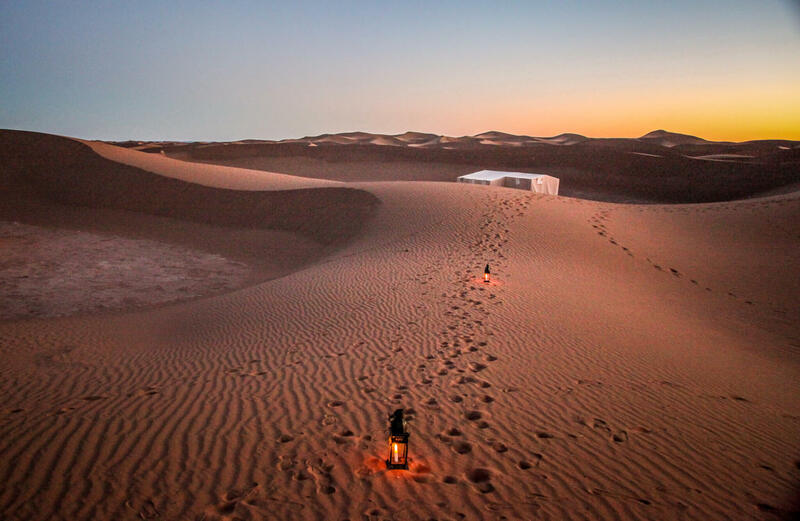 And another Moroccan camping overview from The Culture Trip. And several other tent camps from The Independent. I have no words for how amazing this is. 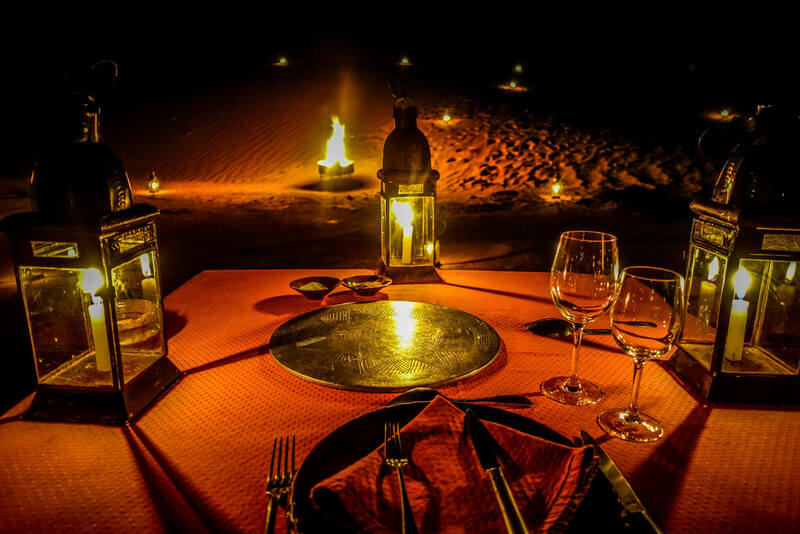 Our desert experience was fabulous, but this is over the top crazy amazing. Adding this to my stops in Morocco. 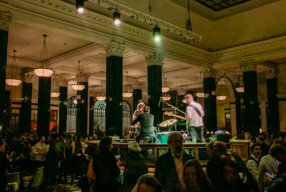 Great post and photos as always. I know there are so many great places in Morocco, Cathy, it’s hard to decide. But THIS one was something I’ll remember for the rest of my life. Really, really magical. I got goosebumps re-writing and re-photoing this post. Fascinating place. I’d love to visit. I thought the pictures were excellent too. Is there any possibility I could use a few for a project. If not, I totally understand, thanks! Probably what were you thinking of?